The BX5100 bus terminal controller offers a high degree of flexibility. The controller is a slave device towards a higher-level CANopen network and acts as CANopen master on the underlying CANopen system (smart system bus SSB). Thus the BX5100 is the ideal device for modular systems with distributed control architecture. 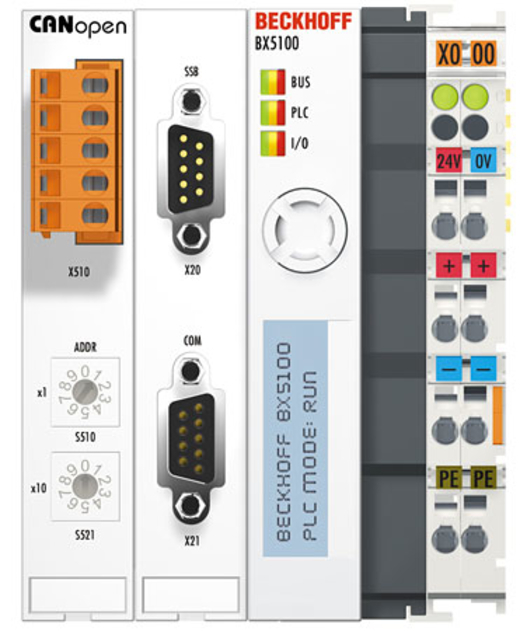 Besides the two CANopen interfaces, the IEC 61131-3 controller provides a K-bus interface for the connection of the Beckhoff Bus Terminals. Additionally, the BX devices are equipped with two serial interfaces: one for programming, the other for free utilisation. Furthermore, the BX features an illuminated LCD display with two lines of 16 characters each, a joystick switch and a real-time clock. The CANopen interfaces support all CANopen PDO transmission types. The local PLC communicates data via network variables mapped in PDOs. The CANopen master interface on the BX5100 is intended for up to eight devices with four PDOs each. The controller is programmed with TwinCAT in all five IEC 61131-3 languages. Programming and online debugging can be done via CANopen or serial interface. Local I/O on both devices is provided by the bus terminal series with more that 250 different terminal types. In the BC5150, the bus terminal controller is also available in a more compact version.